Part of our group challenge is to use alternative media just like they did on the TV. My least favourite and most avoided is watercolour so that seemed like the perfect option for the buildings task week especially as I have inherited a set that I'd not yet used. Hmmmm..... My normal method with new materials is to dive in head first, no reading the manuals for me, see what a mess I make and then go back and research it all properly. Watercolours are everything I thought they were, a black art, impossibly unforgiving and infuriating as heck. Also I think you need pretty decent paper if you are going to invest significant time in piece. I dont even really like the look of too many traditional watercolours but I thought it worth giving them a fair crack and so have also used them along with ink and wash in some random sketches and some life work. I certainly dont think I am a convert and at times I felt like I was back at school - and I mean in a bad way. As for buildings, I think I prefer organic forms but probably need to do a few more of those too. 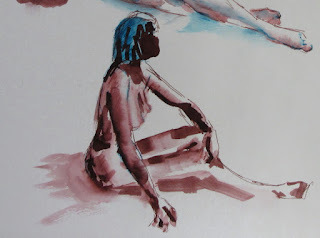 All in all I did appreciate the benefits of water media for small quick sketches and I'll maybe have a go with a few more figures in a single pigment but overall I'll leave the more ambitious stuff to the would be Sargents. Various times, sizes and methods from the last few weeks life sessions. Thanks Jessica, not sure about excellent though.